(Mens Snug L) Ugly Xmas Sweater Vest! Mittens, Hearts & Bears in Stockings Patchwork Cardigan! 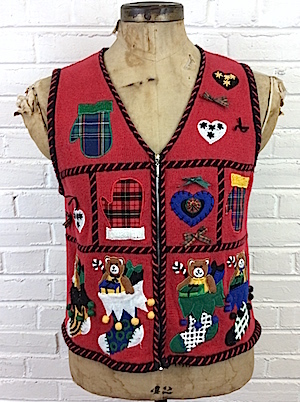 Home > Items just added 4/3-4/17 > (Mens Snug L) Ugly Xmas Sweater Vest! Mittens, Hearts & Bears in Stockings Patchwork Cardigan! Ugly Christmas sweater vest! Red knit sweater with a patchwork look filled with hearts, plaid mittens and teddy bears in stockings! Images are separated by black bands with embroidered red stitching through out it. Sleeves are covered with black and white candy canes. Sweater is embellished with plaid bows and 3D puff balls. Has one teddy bear in a stocking on the upper back of the sweater. Tagged by Designers Originals Studio. Ramie/Cotton blend. Condition: Very Good. Has some light pilling in a few spots in the sweater. Does not detract from the awesomeness of this sweater.